As questions continue to surround the official story of the devastating 2012 shooting of schoolchildren and staff in Newtown, Conn., one researcher has prevailed in a lawsuit brought against him by the father of one of the slain children. Dave Gahary interviewed former state trooper Wolfgang Halbig to learn more about the situation. TAVARES, Fla.—As the five-year anniversary of one of the worst mass shootings in U.S. history approached, this small city in central Florida—located 1,144 miles from Newtown, Conn.—recently played host to the ongoing drama around whether or not the Dec. 14, 2012 Sandy Hook Elementary School shooting took place as the government says it did. Wolfgang W. Halbig, who is convinced no children were killed at Sandy Hook, prevailed in a lawsuit brought against him by the father—Leonard Pozner—of one of the children murdered by 20-year-old Adam Lanza. Halbig achieved mass notoriety when an interview that this reporter had conducted with him revealed that Halbig had been visited by two homicide detectives from his local sheriff’s office, who asked him to stop asking questions about the shooting. Halbig, a former Florida State Trooper and school safety consultant, is best known for his request to have his “16 simple questions” about the event answered by calling and emailing multiple agencies as well as by filing dozens of Freedom of Information Act (FOIA) requests. Pozner brought the suit against Halbig when Halbig revealed on his website the contents of a FOIA request, which included some of Pozner’s personal information. This reporter attended the Nov. 7 hearing in Tavares and conducted an exclusive interview with Halbig’s attorney, Caleb Payne, who discussed a bit of his client’s history vis-à-vis Sandy Hook and the details of the case. American Free Press asked him how he got hooked up with Halbig. Payne explained how Pozner came to sue Halbig. In a disturbing turn of events, a symptom of the police state warned about by John W. Whitehead in his A Government of Wolves: The Emerging American Police State, state agents simply showed up at his house unannounced, wanting to rifle through Halbig’s personal belongings just for asking some questions. The FOIA contained Pozner’s mailing address, a post office box, but that was enough for him to hire a lawyer. In response, Halbig not only removed the personal information—which he wasn’t required to do—but also deactivated his website, sandyhookjustice.com. Pozner, however, continued to harass Halbig. The judge ordered Pozner to be at the next hearing and produce the answers required via discovery—requests for answers to interrogatories, production of documents, and depositions. The chance to question Pozner under the watchful eye of a video camera never arrived, however, as Pozner dismissed his complaint the afternoon he was required to provide the discovery answers, leaving Halbig with a big legal bill and a shuttered website. Halbig says he will countersue for attorney’s fees and costs. Crisis actors have spilled the beans at other fake events, the truth is hard to hold back. Jesus reigns, no one died at Sandy Hook, the main stream media is worthless. Thanks. Last week or so Jim Fetzer mentioned on one of his radio shows (probably Truth Vs. News) that three of the Sandy Hook kids that were supposedly killed that day have now given to Wolfgang Halbig their sworn affidavits that they want the truth to come out in the mainstream media because they want their lives back. Hopefully that will some day happen. Fake SWAT Wheeler is hold the rifle BY THE MAGAZINE as it’s pointed behind him! Sandy Hook Sloppy Sniper (David Wheeler) pointing a rifle at women and children? Wheeler is an anti gun activist, complicit in deceit. When are you going to get outraged? Maybe they have silenced Haibig, but there are those of us who remain convinced Sandy Hook School was a psyops hoax with no loss of life. The visible evidence taken as a whole cannot support the claim of an attack, nor the reported body count. Great! Halbig has the right to question without being harassed. Now someone should do an article on what Jim Fetzer has had to face… and on more issues than just Sandy Hook. 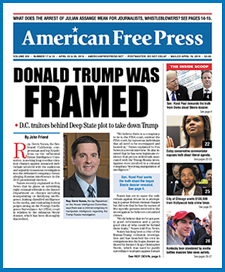 I am still undecided but I am very happy that there are honest, reliable sources of information such as American Free Press which have the integrity and persistence to seek and proclaim the truth. Finally, justice for Wolfgang, may this be just the beginning of a wonderful 2018 for all of us that could see what really happened at Sandy Hook. Any chance other people will fall with Pozner? How about the lying governor? Lenny thinks he can hide away in Florida and somehow his participation in this obvious hoax is just going to disappear, it’s never going to. Can not wait for that cowardly weasel to be exposed. Seems to me he really lost. Aside form the legal bills his website is still gone, so they accomplished what they set out to do, silence him. Thank you, Wolfe Halbig, an immigrant American fighting a battle we should all be funding. Anyone know of a “Fund” we can contribute to ? Scott Bennett shared this article on FB. I replied to it addressing the school nurse who saw no dead child, as her eyes were covered by law enforcement. I must have hit an operative’s nerves. Wonderful news. Let’s hope the Wolf can make that punk Pozner pay! God I hope karma gets it’s hands on him! NO CHILDREN DIED AT SANDYHOOK! The FBI have said “no one died at Sandy Hook school”! Yep. Backed off at the last-second because he knew the BS Sandy Hoax lie wouldn’t stand up IN COURT. I hope that all the masterminds and their accomplices in the staged Sandy Hook “shooting” to soon be brought to justice.All of them. The big legal bill that Agent Posner left Halbig with IS the weapon.